Whooah! I stripped off wallpaper from this wall around a window in a home that had some water damage from Hurricane Harvey, to find this black powdery stuff – mildew. 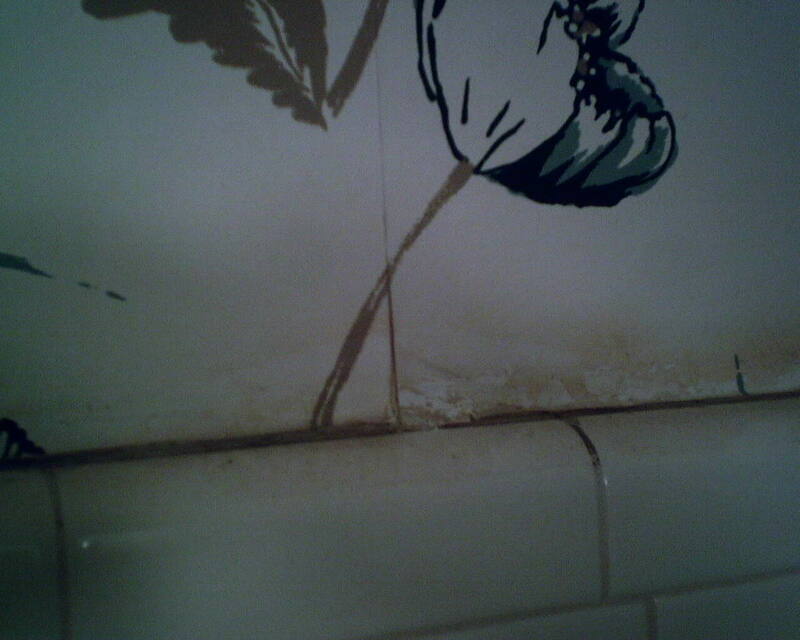 You don’t want to put wallpaper over a wall that has mildew, because the black stuff will continue to grow. 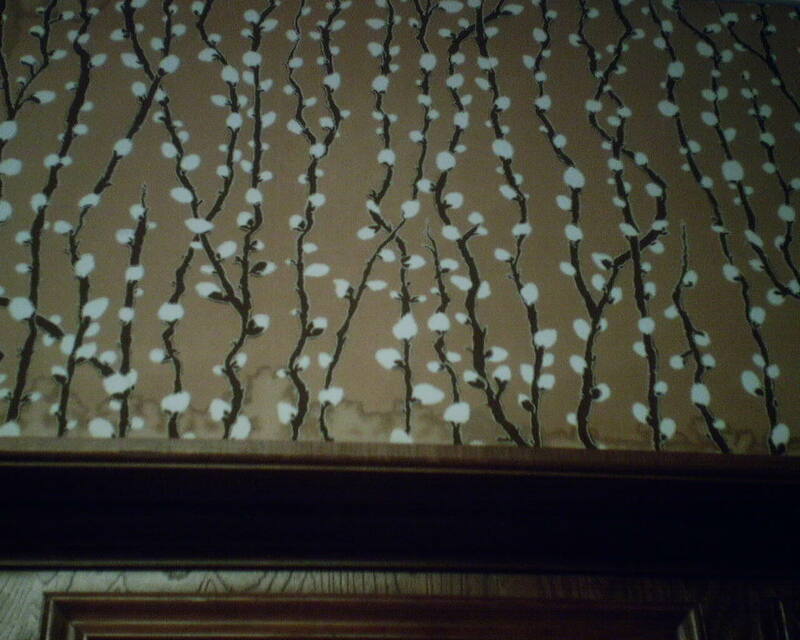 And because it’s chalky / powdery, it the wallpaper will not stick to it. 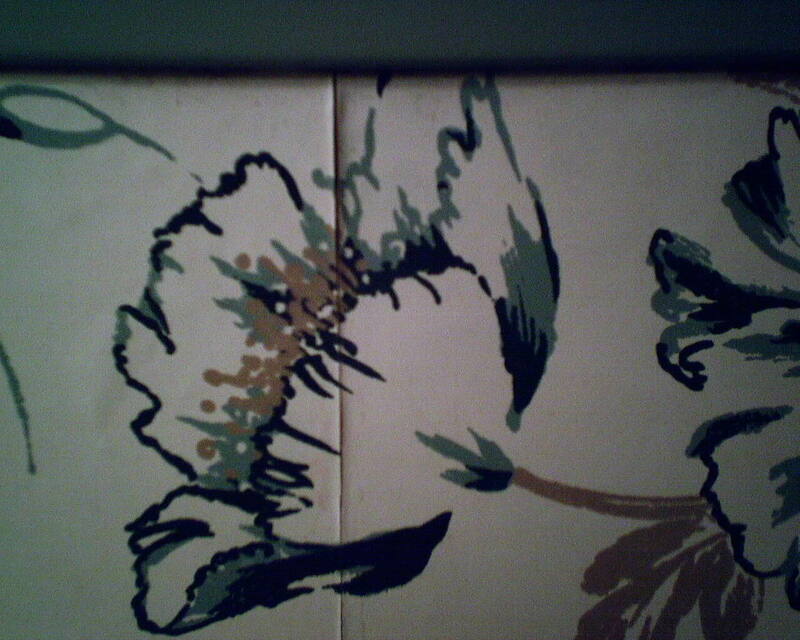 And it will also work its way through the wallpaper and create a stain on the surface. I use bleach to kill the mildew and remove it from the wall. 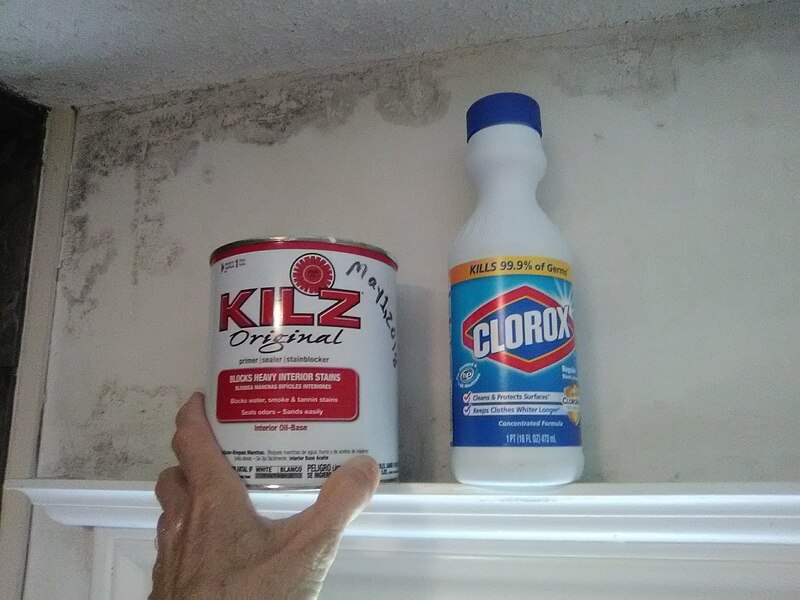 Once dry, I use KILZ Original oil-based stain blocker to seal the surface. In this case, I also skim-coated the wall, to make it nice and smooth. 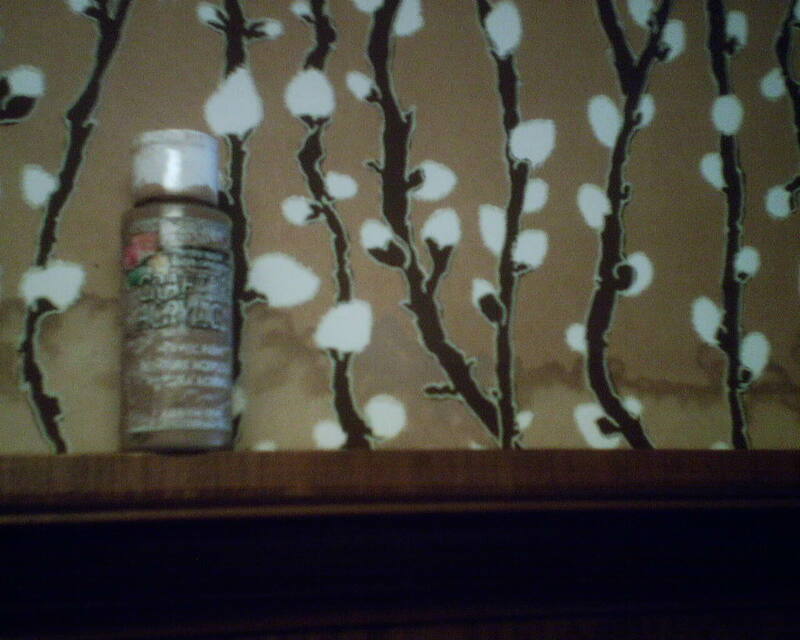 I will follow that with a coat of Gardz, a penetrating sealer that is also a good product to hang wallpaper on. 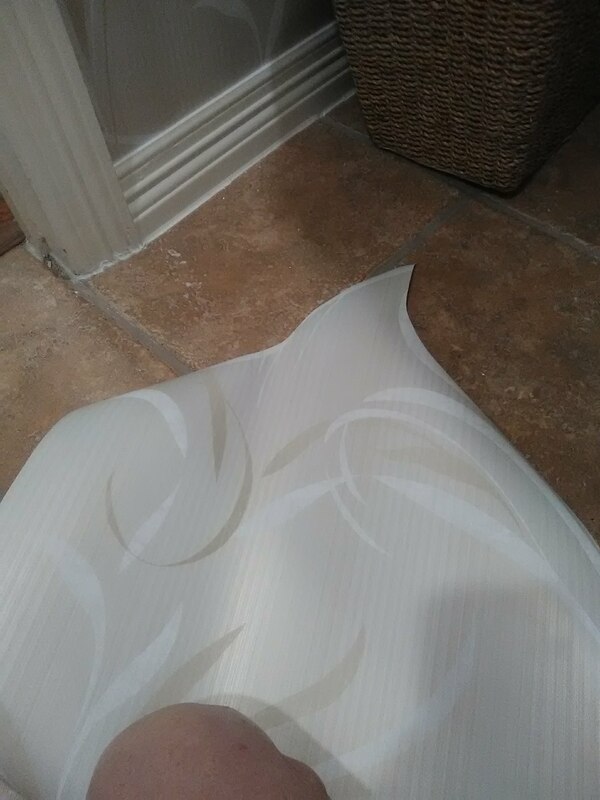 This couple had water damage from Hurricane Harvey, and I repapered their powder room a month or two ago. Well, recently a pipe burst, and, long story short, they had to replumb the whole house. 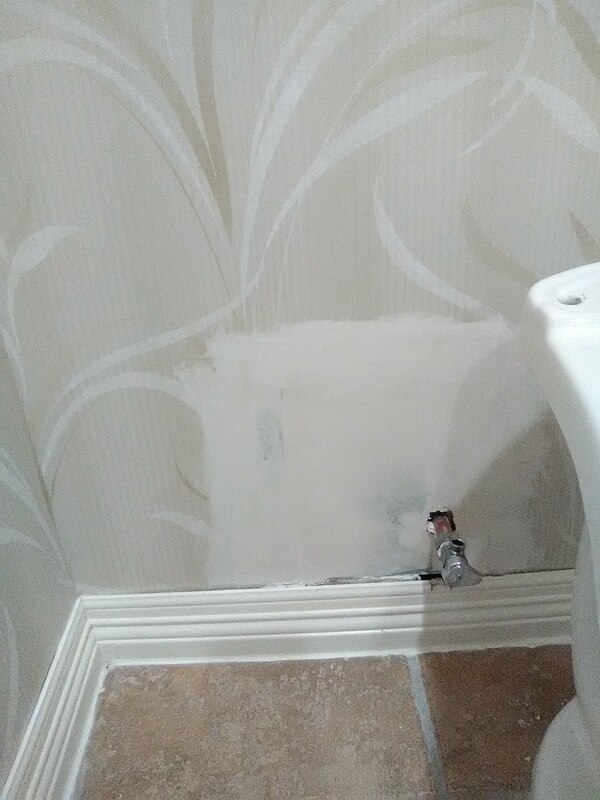 To run the new pipes, the plumbers had to cut holes in the drywall. 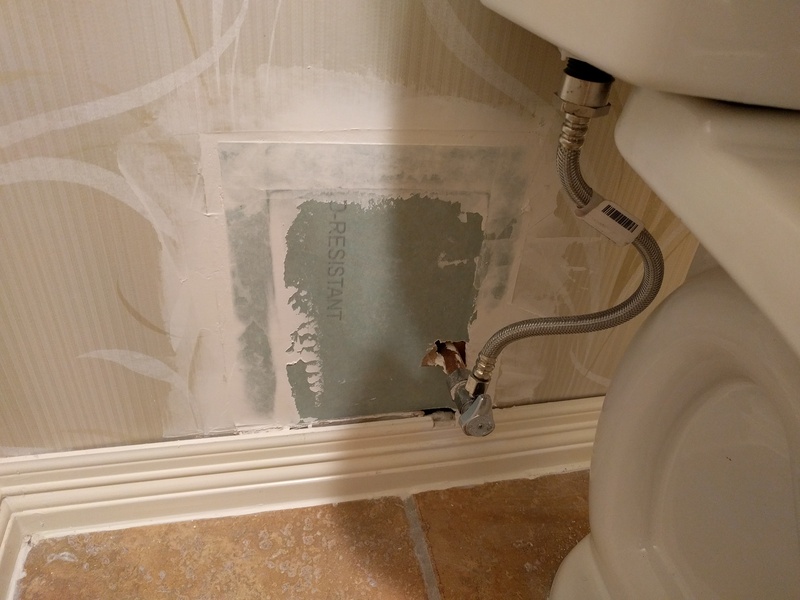 The top photo shows where the plumber patched a hole with a scrap of drywall. 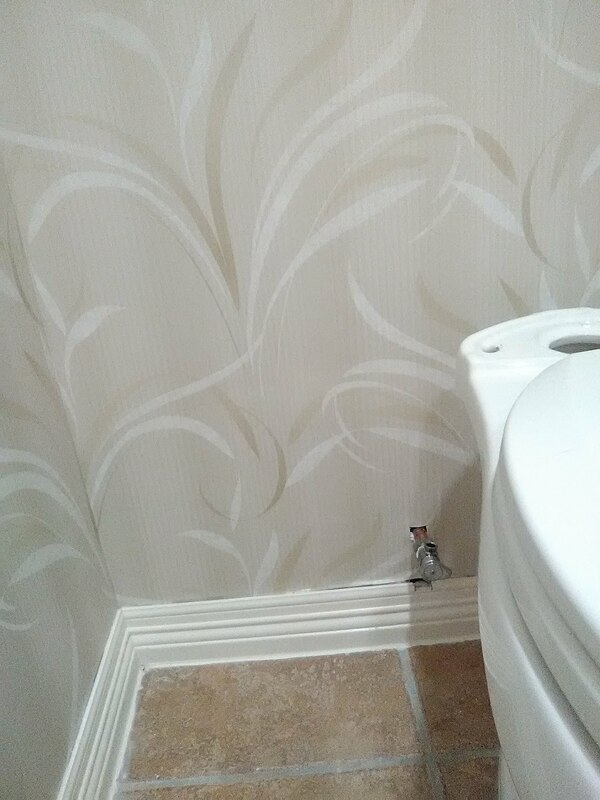 He left some irregular areas and rough edges that would show under the wallpaper. So I skim-floated over these areas and then sanded smooth, as you see in the second photo. 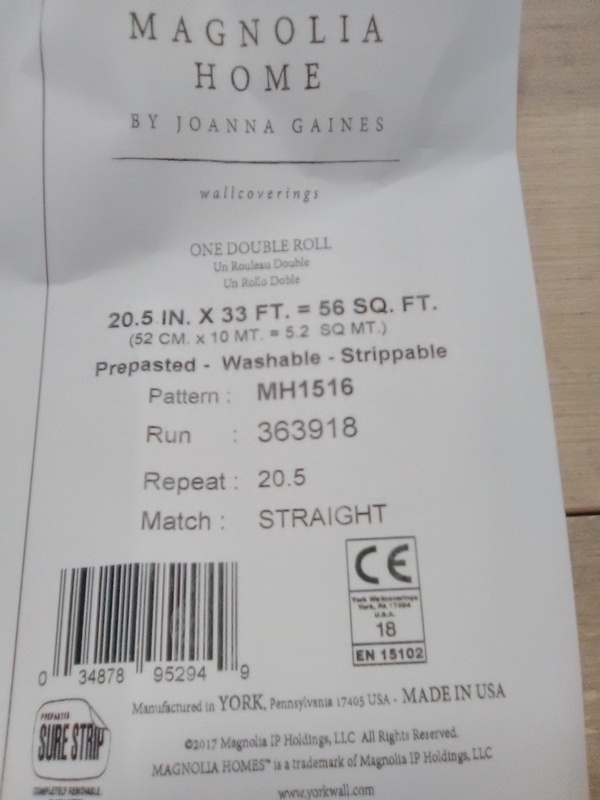 There was precious little paper left, so a patch was called for (rather than replacing the whole wall). 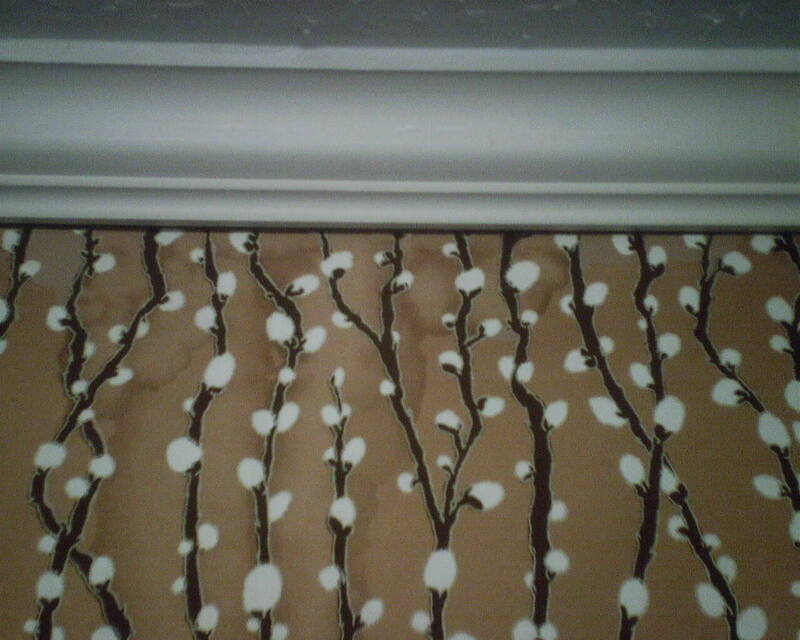 From leftover paper that matched the pattern around the drywall patch, I cut along the pattern design (third photo). 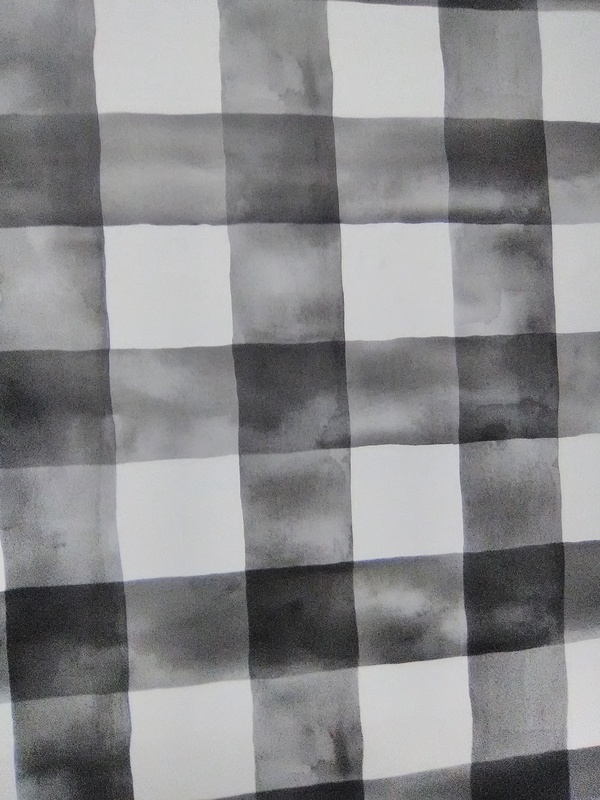 This would be less visible than if I cut a square patch with straight edges. 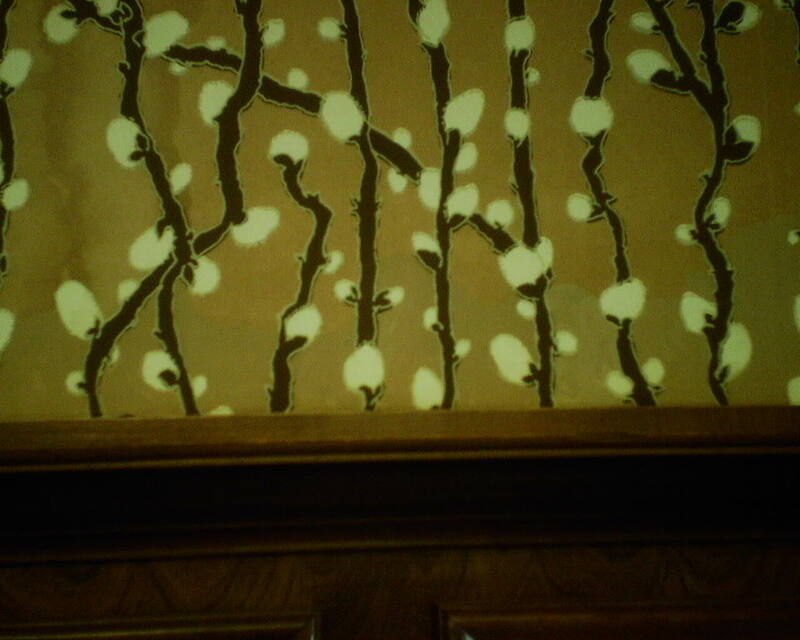 This wallpaper over kitchen cabinets had been stained by a water leak. 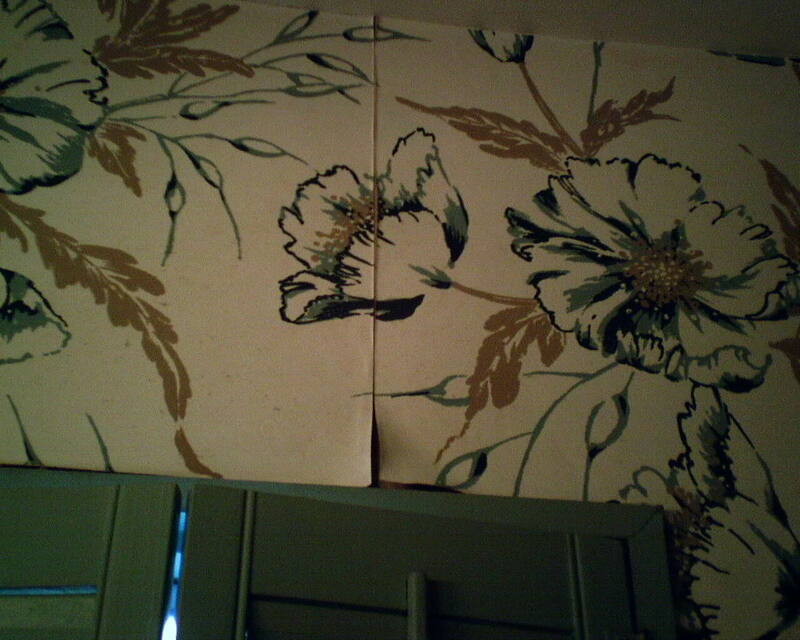 Water ran down from the ceiling (see vertical stains in the first photo), and then pooled on the bottom edge, wicking up into the bottom few inches of the wallpaper (see second photo). 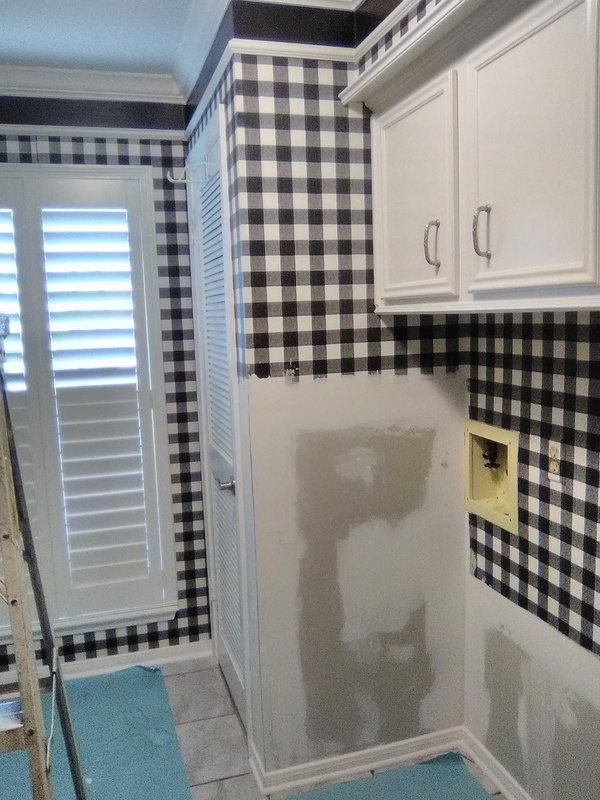 The original plan was to replace the whole section, but the left over wallpaper had been stored in the hot Houston attic for 35 years, and was way to brittle and fragile to be worked with. So I got out the artist’s brushes and the craft paints. These are the little bottles of matt finish acrylic paint that can be bought at Michael’s. I mixed various amount of three different colors together, until I got a mix that matched the background pretty well. This was tricky, because paint looks a lot lighter when it’s wet, and it was had to predict how dark it would be when it dried. But I got a pretty good match. See the last photo. I didn’t cover just the stain, but the entire area from stalk to stalk, to make the color as even as possible. I covered the stains at the bottom of the wall, and a few of the horizontal stains near the crown molding. 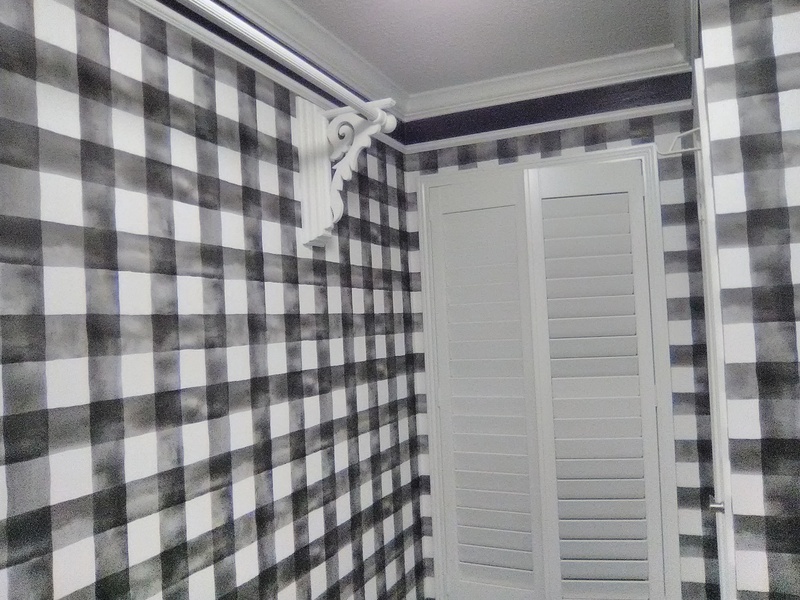 The homeowner said she could live with the vertical stains, and this is good, because painting in larger sections in more prominent areas would have caught the eye much more. From even a short distance, you can’t even tell that there ever were any stains.